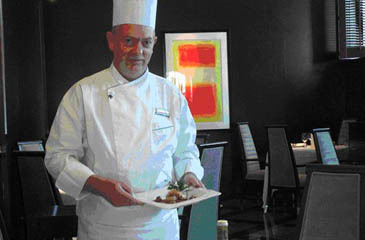 Executive Chef Hans-Werner Vogt brings over thirty five years of culinary experience, including work in several five-star hotels, to Sheraton Grande Walkerhill, where he will be overseeing banquets, F&B outlets and all food service activities at the hotel. Vogt comes to Sheraton Grande Walkerhill from Swissotel Nankai Osaka, a five star property, where he served as Executive Chef. Prior to his Osaka assignment, he had worked at both Westin Chosun Hotel locations in Korea, as well as culinary positions in Japan, Germany, Hong Kong, Thailand, and Bermuda. German born, Vogt has devoted his life to finely tuning his culinary art. His passion for his craft has taken him all over the world. In the process, he has not only honed his culinary skills but he has acquired an ear for languages as well, presently speaking German, Thai, Korean and Japanese. Following graduation from the Professional Chef's School in 1969 he has worked in several 5 star hotel kitchens around the world. Since attaining his Chef's Master Degree in 1983, Vogt has been specializing in banquet operations, catering and the management of multiple F&B outlets.